I’m off to Orlando this weekend for Pillsbury’s 44th Bake-Off. I’ll be there blogging and tweeting, courtesy of Pillsbury, with a few other bloggers. The first I’ll mention is Amy Sherman of Cooking with Amy. We’ve never met before, but I’ll be bringing her bialys from New York, and she’ll be bringing me some Philz coffee from San Francisco. This is exactly the kind of thing that makes me love the blogging community. We’re here to share food. While I’m gone, I also wanted to leave hubby with something yummy, something he loves, and something easy for me to put together. Sparked by my purchase of bialys, I decided on Whitefish Salad. You won’t believe how easy it is to make! 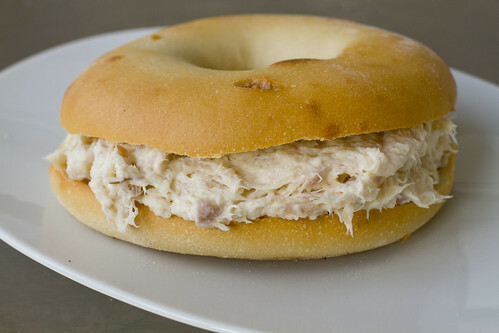 You can get Whitefish salad on a bagel at any bagel shop in New York, but you’re going to pay $9 for it. 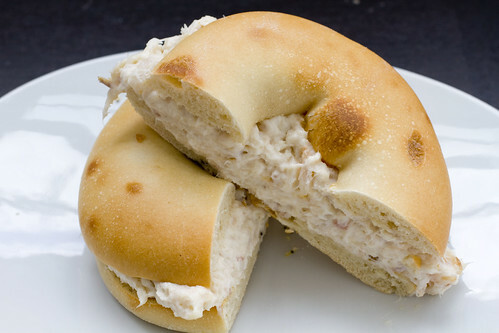 You can make your own Whitefish Salad for about $4 to $6 per bagel (depending on where you buy the smoked whitefish), and all it is mixing two ingredients together! It’s just smoked whitefish and mayonnaise. 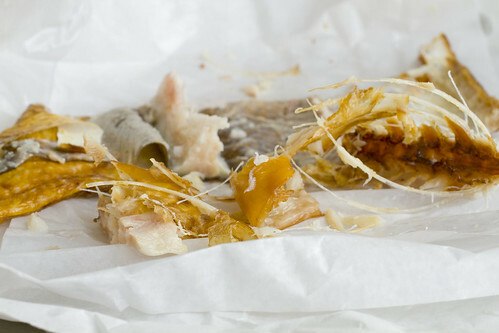 Buy smoked whitefish, which is sold by the pound at most bagel shops and Jewish delis. Peel back the skin (separates very easily) and discard. 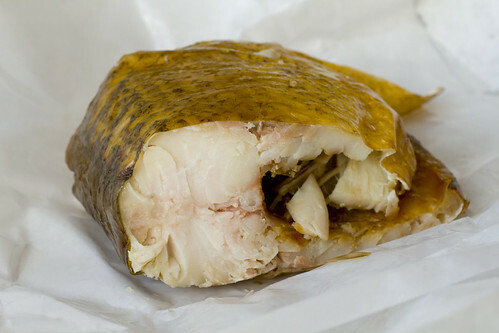 Pick out the fish meat, carefully leaving behind bones. Place all the chunks of fish meat in a bowl. Use two forks to shred the fish. Stir in mayonnaise. The amount you use is just personal preference. 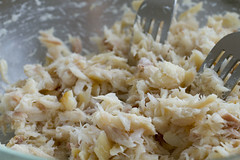 I prefer about 1 tablespoon of mayonnaise per 1 cup of shredded smoked whitefish. 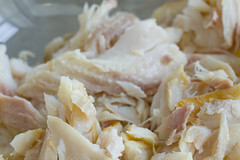 Lon prefers about 2 tablespoons of mayonnaise per cup of shredded smoked whitefish. Spread on a bagel or bialy. posted by jessica	at 10:44 AM	Filed under Jewish, Un-Recipes. You can follow any responses to this entry through the RSS 2.0 feed. Both comments and pings are currently closed. What fun, Jessica! I’d love to go to one of those Bake-Offs! I hope you’re going to tell us all about it and that you’re taking photos!! 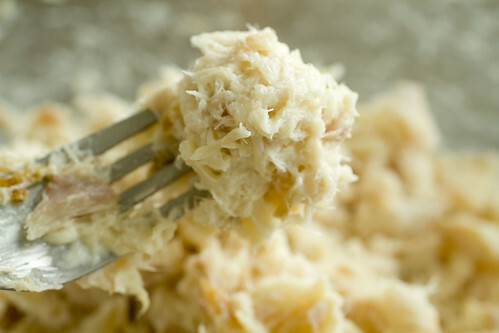 BTW: Great whitefish salad recipe! GOOD LUCK AT THE BAKEOFF!!!!!! Thanks everyone. I’m not competing anon, just observing and hopefully tasting. Kim, the bialys were from Daniels Bagels in East Midtown/Murray Hill. I’m not a bialy expert but they were a bit bland to me. I think for the classic bialy you have to go to Kossar’s on Grand st on the lower east side. Mmm, looks great! Have fun at the bake-off, that sounds fun! Mmm! Have a great time in Orlando! Kasi, that was my original plan but I read a bunch of complaints that it has changed ownership and isn’t good anymore. Oddly, there aren’t any other places known for bialys though. What about Russ & Daughters? Hope you’re having fun! Kim, I didn’t think they made Bialys…I thought they just buy theirs. Do you know? Its refreshing to see whitefish salad with no added fillers, like celery,or carrots,and onions.